This is the newest Kowa binoculars to use the PROMINAR brand name, utilizing four XD lenses. These high performance binoculars use the technology of the TSN-880/770 series spotting scopes and pair XD lenses with convex lenses made of glass with special dispersion properties to reduce chromatic aberration to a further degree. This advanced technology creates a bright image with high contrast and remarkable color reproduction that can not be duplicated by a normal achromatic lens. 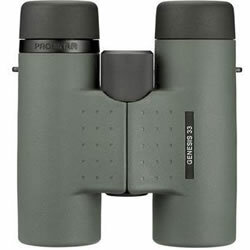 The GENESIS/XD33 Series are the "WIDE-ANGLED binoculars" and comply with the ISO 14132 standard.